We're coming down off of a crazy week. Last week was day camp. Although I was teaching and the kids were in class, I missed doing Mommy School with MY kids. This is the week before the 4th of July, so we're going to focus on America. Books: "From Cloth to American Flag"
I'm trying to move away from all plastic all the time into using more glass and metal tools. These dessert glasses came three in a pack from the Dollar Store. The kids did very well using them and enjoyed the extra responsibility. 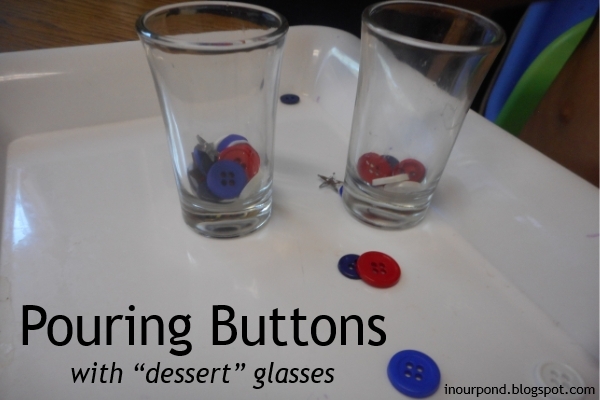 We didn't break the glasses and the spilled buttons were good for extra fine motor skills practice. The printable for this activity can be found HERE. The animals are from the Safari Ltd North American toob. My kids loved this work. 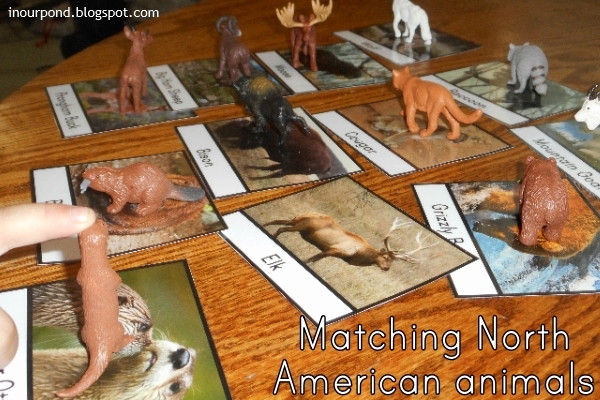 We also spent a lot of time naming the animals and talking about when we've seen them. 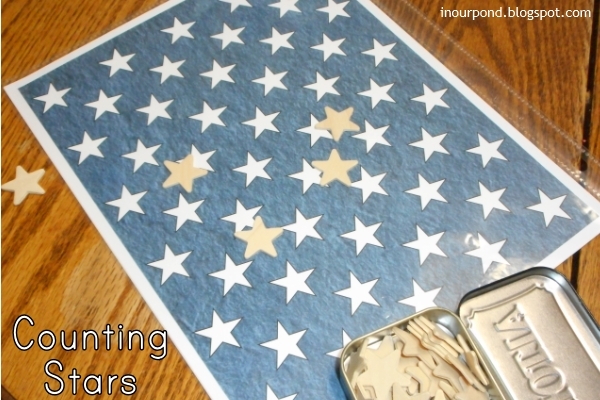 The wood stars came from Amazon, but you could also find them at a craft store. The blue paper is similar to the one you can find on Pinterest. Dragonfly and I only counted five stars before she lost interest. We spent quite a bit of time talking about how the fifty stars represent the states in the union of the United States. When she (and the others) get older, I think it would be neat to have them pin state flags on each star, Montessori style. I originally bought these little red, white, and blue mini clothespins for a count and clip activity, but my kids have very little interest in counting right now. Following my 2 year old's lead, he poured them from glass to glass instead. He did much better pouring the pins than he did the buttons. While the other two were finishing up their nap one day this week, I kneaded up this play dough for Dragonfly. 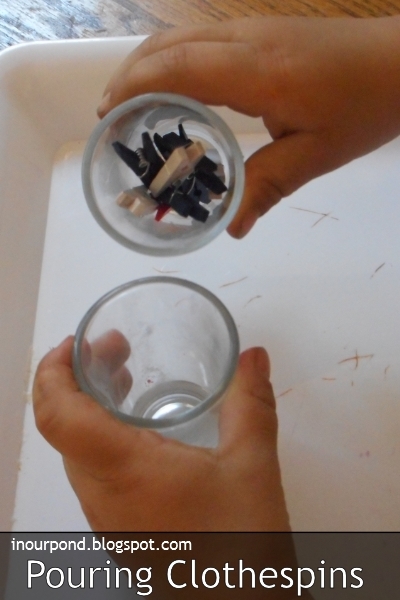 Then I gave her some buttons from our pouring activity and some flag toothpicks and invited her to play with them. After a while, I gave her a meat pounder and let her bang the buttons into the dough. She really enjoyed the activity and the hammer was heavy enough to provide some work for her arms. 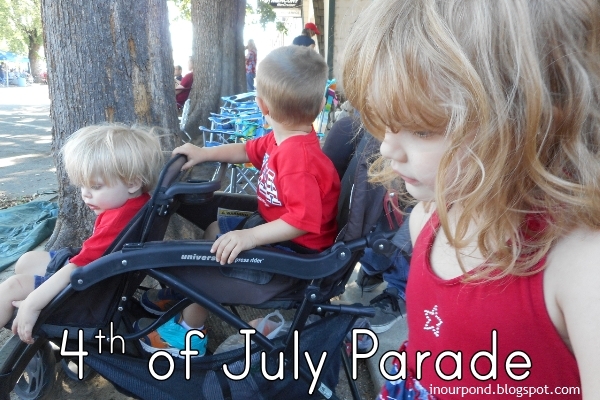 Tadpole (21 months), Skimmer (34 months), and Dragonfly (almost 4) at the parade. They loved it! Follow In Our Pond's board "A is for America" on Pinterest. What activities have you done to teach about your country's history? 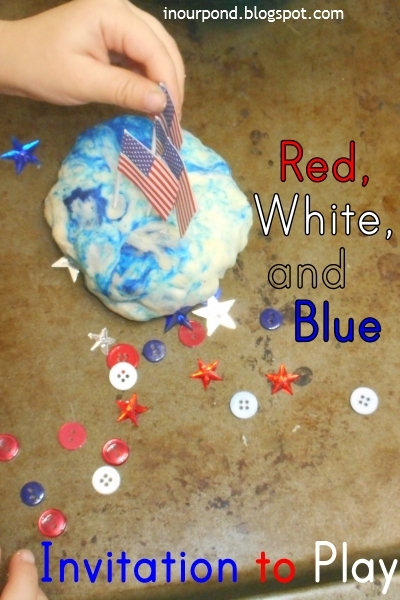 What other red, white, and blue activities would you add? I'm always gathering ideas for next year.